Sometimes it can be hard to separate hype from reality. And, let’s be honest, the software industry doesn’t have the world’s greatest record in that regard. But there’s usually a pretty solid way to establish the abilities of any specific product or platform: look at your own requirements, establish exactly which campaigns and interactions you want to deliver - and to who - and ask any potential vendor to build that for you in the product. The alternative - allowing yourself to be prompted by vendors rather than driving the conversation - means you’ll end up in a familiar position, one in which you’re building the campaigns you can rather than those you actually would if you were not restricted by the technology you’re using. What does that have to do with our own recently announced Intent Targeting? Well, quite a lot. We worked with a number of our customers to establish the use cases and approach they wanted to be able to take, and we spent time building a targeting engine that provides what practitioners truly need. 1. The ability to create complex target audiences, based on multiple criteria each of which can have recency and frequency criteria applied independently. These audiences should be based on up-to-the-minute data, but also be informed by user activity from any time in any channel. 2. The ability to build these audiences quickly and easily, without having to leave the platform, and without requiring input from any other part of the business. With Intent Targeting, that’s what we delivered. In this post (which will be the first of several addressing multiple verticals), I want to show you what that means in terms of three sample audiences, for three sample campaigns relating specifically to the travel industry. Let’s do it! A classic audience for a textbook ancillary revenue campaign. 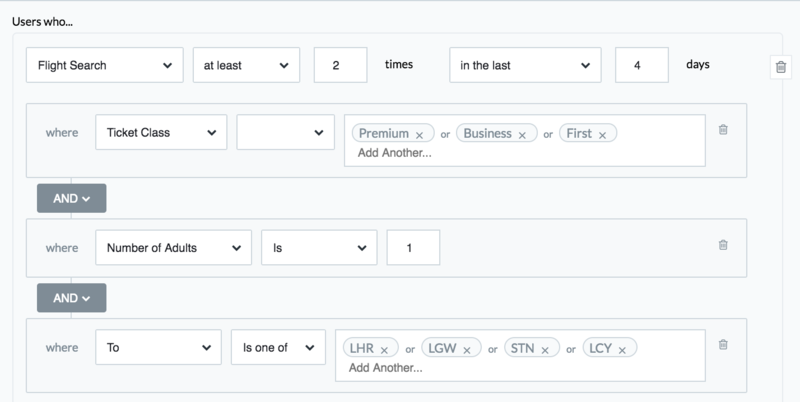 If I want to send an interaction to those customers who have booked a flight recently and are about to fly, I can build a query both against the top level event (the booking) but also specify within that the outbound and return dates in order to time the campaigns to perfection and reflect the greater demand for priority boarding at peak season. I can also fold in the number of infants on the booking (in this example showing more than one), in order to deliver creative specific to the needs of families wanting to sit together, for example. 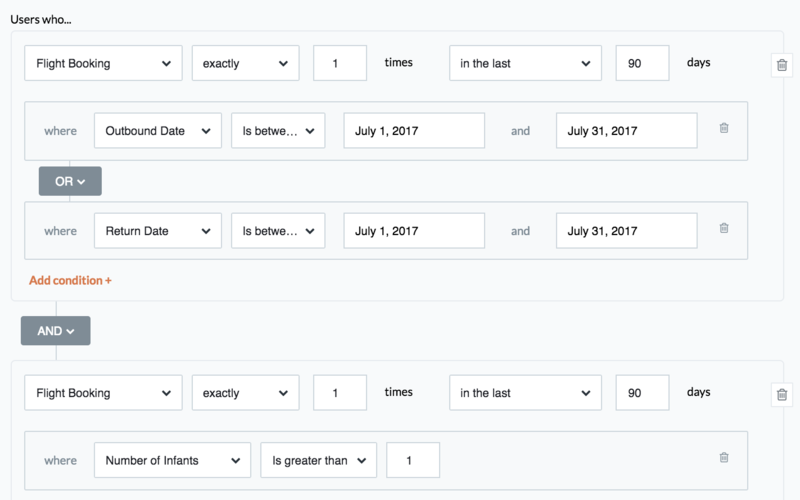 A textbook campaign that demonstrates exactly what is at the heart of Intent Targeting - multiple recency and frequency options across multiple criteria. In this instance, to keep things simple, we’re showing just two. Firstly, recent flight searches from a specific location, and with a frequency and recency that implies a certain amount of intent. Secondly, a long term history of items purchased can identify users who have bought holiday packages or cruises at ANY time in the past. This is an audience ripe for a promotional campaign around trips of that type, leaving from London specifically, for next year. Note that we specify that no package was booked within the past 90 days - we don’t want to send a holiday promotion to someone who has booked their trip already! Business Class and up represents great margin business for any airline. This query helps identify business travellers who are ready to fly - having searched at least twice in the past 4 days, and who are travelling alone. We can also set an arrival destination (London), and most importantly, those searches have included times when the ticket class is business, premium or first. We have all the ingredients to deliver a highly-focused and effective campaign - if we have inventory in business, premium and first on flights to London in the upcoming days (and yes, Swrve can integrate that data for you!). Hopefully these three examples give some idea of exactly how powerful our Intent Engine really is. But more importantly, I hope they demonstrate how complex audiences can get (and these examples are deliberately simple). It is imperative for anyone investing in marketing or interaction technology to think clearly about what they wish to achieve and then ensure their chosen platform can deliver it.